It was difficult to believe that we had only been in Africa for four days, and we had seen so much! The beauty of the savanna and grasslands sprinkled with the occasional flat-topped acacia tree is breathtaking! Some real "Out of Africa" stuff! Much of that classic movie was shot in the Kenya and Tanzania landscape that you almost feel like you have been transported through the screen and into the movie! Our driver/guide in Kenya had been a wonderful man named Enfante (not really sure how to spell this!) - - and it was his job to get us safely to the border-crossing with Tanzania at a spot called Namanga. 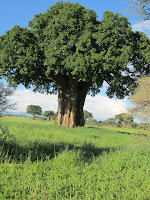 Our ultimate destination at the end of the day was to be the Tarangire National Park and the Sopa Lodge inside the park. Our new driver was to be Christopher - who turned out to be a wonderful tour guide, a most knowledgeable expert on Tanzania and a terrific guy all-around! We got dropped-off at the border and - well - - let's be honest for a moment...Southern Kenya and Northern Tanzania are not the most wealthy places on the planet. We live in India, which has it's own problems, to be sure....but the poverty in the area is pretty striking. The Masai tribesman look perfectly happy, herding their cattle...but - the rest of the place looks so downtrodden. Everything needs paint, the roads (LOL) are unpaved if they exist at all, the actual customs-stations for both countries are poorly organized and mismanaged - - and - unfortunately you have to check OUT of Kenya on one side of the border...and then check IN to Tanzania!! Kind of a Mess. Tanzania is a socialist country...and one sees many more soldiers with automatic weapons on the Tanzania side of the border. And - purely by observation, I would say that Kenya is the far-more-wealthy of the two East African countries. Transportation is terrible...everybody walks! Out in the middle of NOWHERE you will see kids walking to school, women carrying water and children and bundles of wood...and one has to wonder where the hell they are going! They do have large (usually Toyota) vans....this is their "bus system" - they pack 20+ people into these things...I got claustrophobia just watching them drive by!! But we came for the animals!! After a brief stop at a hotel for lunch in the town of Arusha - we pushed onward into Tarangire National Park. As you leave Arusha behind, you start seeing the landscape changing constantly. Turning into the actual park is amazing....the animals are all over the place....zebras, giraffes, elephants...the cutest little creatures called the dwarf mongoose that take over termite mounds - - and hundreds of different kinds of birds!! This part of the world is a bird-watchers paradise - - I don't consider myself much of a bird-watcher - but this place may have changed me for good!! Beautiful birds of every size and color!! And the unique baobab trees (see my photo above left) that surround the Sopa Lodge...makes it feel like you are on another planet!! This is an informative and interesting post for I think it is very useful and knowledgeable. Thanks for sharing. . .
Our African Safari Continues...Masai Mara!! Amboseli ... The Second Day - Christmas!